Our plant spirit allies offer a beautiful way of uniting nuna (our soul) with the sacred hoop of our mesa. We are drawn into a communion with the ancient plant lineages when we enter the plant’s medicine. Through this intimate relationship a compacto emerges allowing that inasmuch as we pick the plants, the plants pick us. In this way they speak to us revealing ways to respect and offer their medicine. The plants have an interconnected living consciousness like the cosmovision of our mesa. Our plant relatives inhabit a body, spirit, intelligence, and soul. When we partake of their medicine, a sacred relationship is created, which deepens our trust in their healing ways. The shamanic art of consecration, through prayer and humble intentions, invokes the Holy Ones, the Shining Ones, and the Tirakuna (watchers) around the mama pacha (natural world) to come forward. We listen, attune and receive the guidance of the plant relatives as they bless us and lovingly cleanse, and anoint our mesas, khuyas, apachetas, and ceremonial rituals. The spiritual Grandmother brought a large suitcase packed with white sage to the ceremony. She laid out a colorful blanket and gathered us around in a circle. She opened the suitcase and gently fanned the air with an eagle wing, sending the aroma of freshly picked white sage wafting through the air. She began to tell a story and sang old songs with a wansak (clapper stick) carved out of an elderberry branch. She sang to the ancestors and the spirits of the land as their presence permeated the room. A portal opened and we witnessed the man crossing over the Rainbow Bridge to the star path of the Milky Way. We had traveled between worlds in healing service to his soul’s journey. In that moment I received a visitation, an initiation from the spirit of the white sage. 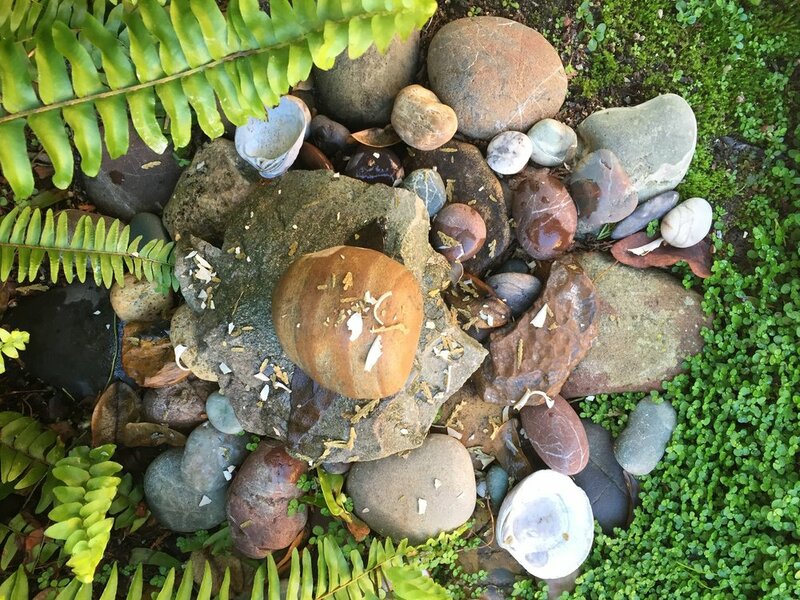 I was called to the art of consecration by remembering my compacto with the plant allies. There are several species of sage indigenous to this area: White Sage, Purple Sage, Black Sage, and Hummingbird Sage. 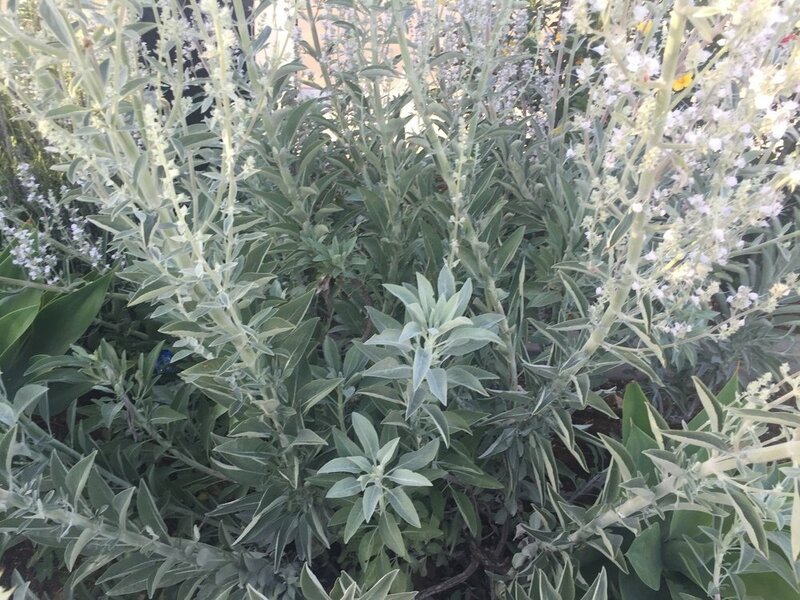 The California white sage, salvia apiana, or waykway (Chumash), has many healing properties. The mountains are covered in chaparral and sages both large and small. The fragrances of the coastal sage shrubs—with their shimmering silver leaves—are ignited by the warmth of the sun and float on the breezes. From April to Mid-July white sage plants bejeweled in white and pale lavender flowers, send spires, upwards of eight feet into the sky. Pollen from the white sage glitters in the sunlight, resembling gold dust carried on the wind. Sages more than a year old are deeply rooted, enabling them to survive fires and drought. The intelligence of these wise, herbal relatives teaches us to root deeply into the Pachamama and to adapt with the changing cycles and seasons of our lives. Here in our backcountry is a place named, Sage Hill, which is covered by a sea of white sage shrubs. The plants live between the Pachamama and the sky canopy—receiving the sun by day and the stars at night. I talk to the sages, telling them how I intend to use their medicine, and then make an offering consisting of either my hair, a libation, cedar, cornmeal, tobacco, or a k’intu. In the spirit of sustainability, the compacto leads me to pick only what is needed. I whisper my prayers and phukuy (blow) them into the wind. A synergy occurs between the seen and unseen realms when we collaborate with the plant spirits. We call in our plant spirit allies to cleanse, and bless us when we sit at the mesa, the apacheta, or sacred places. This partnership energizes the altar or ceremonial ground, clearing and recycling any residual hucha (energetic density). Plant relatives connect us to all the elementals and cycles of the Pachamama. Our compacto with the plant spirits is strengthened when we practice the art of consecration.